portable computer application Ariesys Technology Co. LTD. It is a compact and rugged portable computer, Chassis with a built-in LCD display and a handle on top, It can be configured to be whatever you need it to be (Motherboard or Single Board types of Computers) and carried to wherever you go. Ariesys's 1U slim industrial monitor keyboard, the AMK, is the solution for compacting more computing power into limited space. This revolutionary monitor keyboard combines a spectacular display coupled with a keyboard with built-in pointing device in a compact unit that measures only 1U in height. Occupying a fraction of the space of traditional monitor and keyboard units, the installation of the AMK leaves ample space for other critical components. With built-in analog-to-digital conversion board, the AMK can be connected to any standard VGA graphics card for immediate on-screen display. 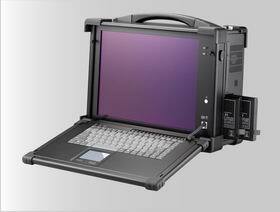 The monitor keyboard unit has a built-in slide rail and mounts easily onto any 19" rackmount cabinet. The AMK 801 is a single port PS2/USB keyboard/mouse connection for connecting to your single server or existing KVM switch box. 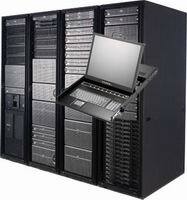 The AMK 808/816 comes with built in 8 ports or 16 ports KVM switch. It supports both PS/2 and USB keyboard/mouse connection without having to deal with unwanted adapter. Simple cable solution will carry the VGA signal without input device signal to help rid of unwanted mess. The KVM has integrated OSD and hot key to help control and manage the switch connecting to multiple systems to better productivity in a space saving solution.